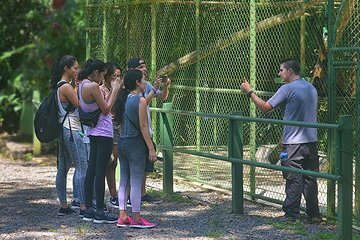 Lær om Costa Ricas mest bemærkelsesværdige væsner på en 1,5-timers rundvisning i et La Fortuna Wildlife Rescue Center. Udforsk centrum med en naturalistisk guide, få et glimt på nogle af centrumets sødeste indbyggere, og se, hvordan bevarelsesindsatsen sparer sårbare arter fra udvikling og poaching. We really enjoyed this educational, 2-hour tour of the wildlife refuge center with our grandchildren. Our guide, Andreas, explained the history of each animal and the plans for re-introduction back into the wild or why the animal was a permanent resident of the refuge. Amazing work that these dedicated staff do for the animals! We saw 3 species of monkeys, toucans, multiple parrots, peccaries and even caimans in the pond. Well worth the drive from La Fortuna. It's a far and expensive taxi ride away but Proyecto Asis itself is a beautiful and inspiring place. Our guide Carlos was very knowledgable about the animals and did a great job explaining the rehabilitation philosophy of the rescue center. We were able to see spider monkeys, toucans, parakeets, parrots, macaws, a margay, and a kinkajou. Highly recommended and for a good cause! Great experience with knowledgable guide. We especially enjoyed hearing the personal histories of each of the animals. Well worth the cost by comparison to some of the other tours. An excellent way to learn about species native to CR, thanks to our very knowledgeable guide. Timing was perfect, a little over 2 hours, although several animals were not visible due to their nocturnal natures. There was less direct interaction with animals than I had expected, but we did not do the volunteer experience, and the guide explained that interaction opportunities vary depending on which animals are in the centre at any given time. The take-away from the day was the harm that humans do to many animals, causing them to end up in places like this. The lucky ones are rehabilitated and returned to the wild, but many end up in a cage for the rest of their lives. Wonderful, informative guide. Excellent facility. Was AMAZING!!! Adrian, the guide was wonderful. My 3 years old son was so happy. I recommend to take the entire tour, with the feeding part.